The Annual Report of the Department of Parks of the City of Brooklyn for the Year 1894 reported five payments to D. W. Binns for drain heads and other cast iron products amounting to $470.40. The U. S. Census non-population schedules enumerated May, 1880, recorded David W. Binns Foundry in Brooklyn, where the value of the previous year's product was $20,647. The foundry employed a maximum of 17 hands, and the ordinary day of labor was 10 hours. Wages were $2.00 a day for a skilled mechanic and $1.25 for an ordinary laborer. The previous year's wages amounted to $6844. The foundry was in operation 12 months in the year, and materials on hand were valued at $10,390. David W. Binns (1848-1910) first appears in Brooklyn city directories in 1871 as a machinist. He was recorded the previous year in the 1870 U. S. Census as age 22, "machinist, iron foundry," the son of James Binns, himself an iron founder, an immigrant from England. James Binns was listed in Lain's Brooklyn City Directory in 1872 as a manufacturer of "car wheels, etc." located at 27 Walworth St., Brooklyn. David Binns seems to have been employed in his father's foundry at that time. It was probably around 1880 that David Binns took over his father's foundry on Walworth St. James Binns was no longer listed at that address after 1880. D. W. Binns & Co. first appeared on Sandford St. in 1889. Directory listings have them either at 51 Sandford St. or 56 Sandford St. from 1889 to 1909. David W. Binns was recorded in the 1900 U. S. Census at age 47 born New York, August 1852. Other census data indicate an earlier birth date. He died January 1910, with the following notice in the New York Times, 30 Jan. 1910, "David W. Binns, a retired iron manufacturer, who for many years had a foundry at 56 Sanford Street, Brooklyn, died at his home, 865 St. Mark's Avenue, in that borough, yesterday, of hardening of the arteries. He was a member of the Brooklyn Union League Club and the Manufacturers' Association of New York. A widow survives him." The David W. Binns memorial at Green-Wood Cemetery, Brooklyn, gives his dates as Aug. 31, 1848 and Jan. 29, 1910. This ad for D. W. Binns General Iron Foundry appeared in the Engineering News and American Railway Journal, vol. XXXVI, no. 27, 2 July 1896. Featured are Machine and Boiler Castings. 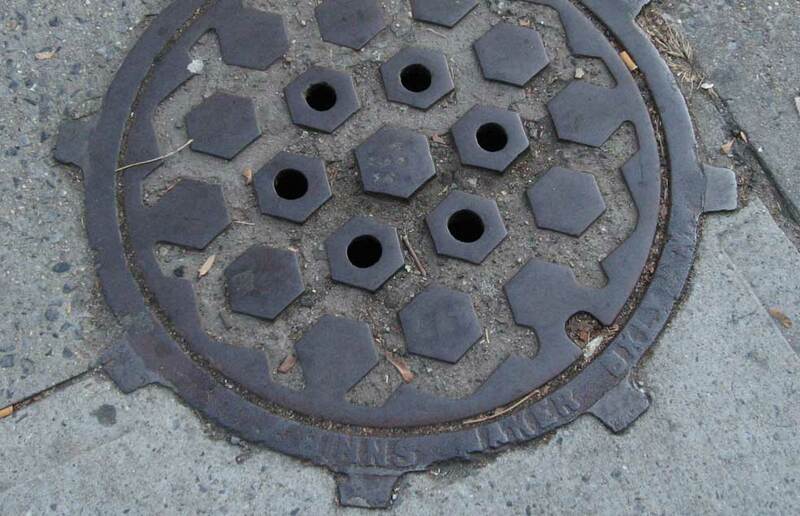 A very similar D. W. Binns "Maker" manhole cover can be found at 400 3rd St., Brooklyn.